Protein in an integral part of an animals diet, currently Ireland is importing a substantial portion of this protein. Why ? when we can grow beans as a protein crop successfully in this country. The EU recognizes this and are offering a protein payment for this crop. Barrett Agri offers Bean contracts. This can be of benefit to farmers who have to implement the 2 / 3 crop rule as part of their crop rotation. • Beans offer great potential to fill the void as a break crop which has been there since the unfortunate departure of Sugar Beet. 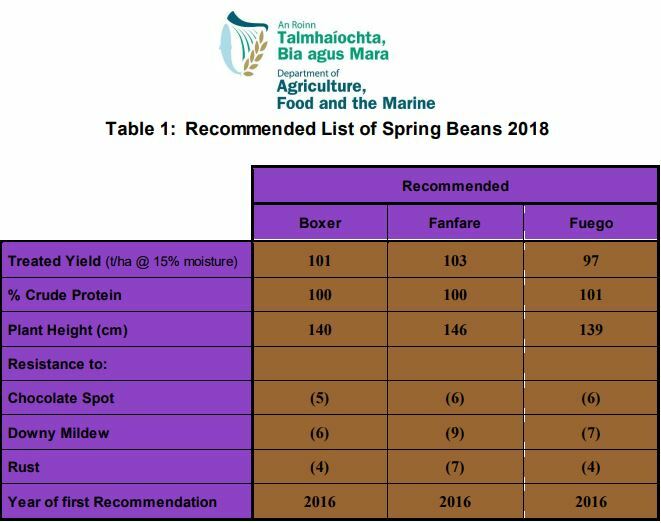 • Beans offer a higher gross margin than spring barley see Teagasc cost and returns 2015. • Beans are a nitrogen fixing legume crop which don’t require any artificial nitrogen, given the current cost of fertiliser, this offers a substantial saving. • Beans offer a lovely entry for a following cereal crop. They leave leaving residual nitrogen in the ground which can taken up by the cereal crop. Barrett Agri supply seed, chemical and fertiliser and full crop walking / agronomy package. Good yielding variety with good protein content. It has the highest yield on the Recommended List and also the joint highest protein content. Fuego has proven to be Ireland’s most popular variety producing consistent yields with Irish growers. Fuego has been in official trials for more than 3 years and is therefore suited to Irish growing conditions. Superior Downey Mildew resistance.